Excellent shoe at a great price. I am very happy with this purchase. which one left or right shoe ???? Hello. 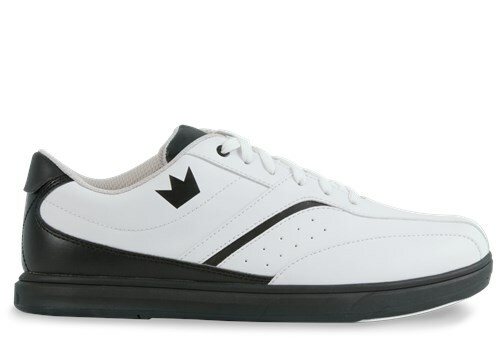 The Brunswick Mens Vapor White/Black will have a universal sole so either a right handed or left handed bowler can use these to bowl. What size shoe would I get if I wear a women's size 9? Would it be a size 7 or 7.5 in men's? Hello. You would want to get a size 7 in mens if you wear a size 9 in womens. i wear a ladies 8 1/2 what would i wear? You would wear a mens 6.5. The widest width that we have to offer is a standard D width. My wife is a size 7 womens shoes, i want to get a pair for me and her, what size can she get? She would need a size 5 in mens. Due to the time it takes to produce the Brunswick Mens Vapor White/Black ball it will ship in immediately. We cannot ship this ball outside the United States.